For all foodies around, I'm inviting you to come and join this year's Yummy Eats organized by our friends at Yummy Magazine. Now on its second year, Yummy Eats will be bigger and better with more food booths, yummy food finds, and an exciting cook-off! 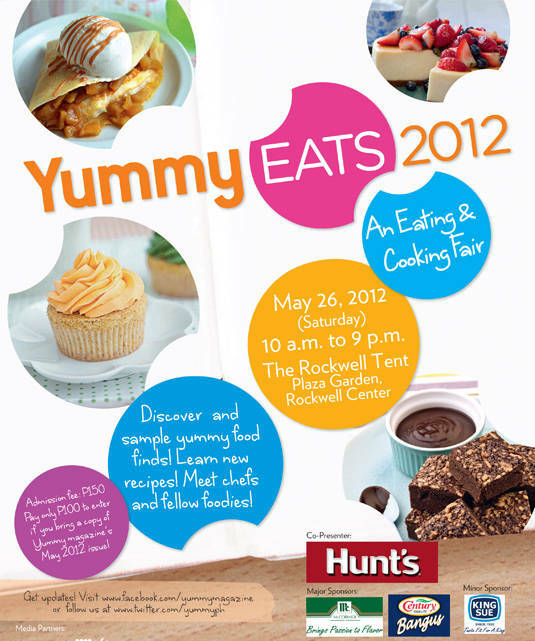 The event is happening on May 26, 2012 (Saturday) from 10AM to 9PM at the Rockwell Tent. Entrance to the eating and cooking fair is only Php150, but can go as low as Php100 if you bring a copy of Summit Media's very own Yummy Magazine May 2012 issue. Be there or be square! Some of the food finds at Yummy Eats 2012 are yet to be sold in the market. And that means it's the perfect time to be one of the firsts to taste them. See you there! For more information, visit Yummy's website, 'like' them on Facebook and follow them on Twitter. The brownies look enticingly delicious. Voice sounds a bit different to me. Not aware with this, I'll tell my aunt about this, thanks for sharing! Saw that episode too. :) See you there!